**Traveling alone: add $515 for a private room (rates are based on double room occupancy). **Traveling alone: add $930 for a private room (rates are based on double room occupancy). Live your own fairy tale vacation in the Périgord region in Southwestern France by either staying in a real castle, or chateau (French for castle) or in a beautiful villa! The Périgord is well-known among the French not only for being the land of one thousand castles (the approximate number of castles found in that region), but also for its dramatic natural settings, for its cobblestone eagle nest fortified Medieval villages, for its monumental caves, and for its delicious regional cuisine. Castles are the signature of this tour as you will encounter them at every turn during your sojourn, in addition to living in one! On this sojourn you'll unpack your bags in an unexpected corner of the countryside where you can get away from the fast paced life and really enjoy the slow pace of the French countryside. Each day you'll head out on excursions that go beyond the typical tourist experience: your hosts have selected a collection of their favorite spots in the area to share with you. These places range from the famous Medieval city of Sarlat and villages with the official title of "Most Beautiful Village in France", to places that many French people don't even know exist because they are tightly guarded local secrets. If you are looking to really get away from it all and immerse yourself in French culture for a week, this sojourn is for you. A lavish meal in a Michelin star restaurant in a beautiful location. Your base will be a countryside castle somewhere in the off-the-beaten path Périgord backcountry. This is stunning region of France where few American tourists venture. The exact location of the castle will depend on the size of your group and the castles or villas available at the time you make your reservation: PLEASE RESERVE EARLY. The generous geography and history of the Périgord, the area where you'll be staying, make it a beautiful, unspoiled region rich in patrimony and natural wonders. It has also remained culturally authentic. Throughout France, the Périgord is noted for its delicious regional cuisine, especially its duck products and its cheeses. It is also known as a center for black truffle mushrooms in France. Although it is in the South of France, it is not an arid region with a Mediterranean climate, but a lush and green one. The Périgord is a landlocked rural area of southwestern France devoid of any big city. It is situated about 2 hours east of Bordeaux and 2 hours north of Toulouse. You'll be living like a local, enjoying typical French breakfasts and dinners served "buffet" style at your castle where you can eat together with the group in the dining room or on the terrace --or even find yourself a private spot for some "me" time. 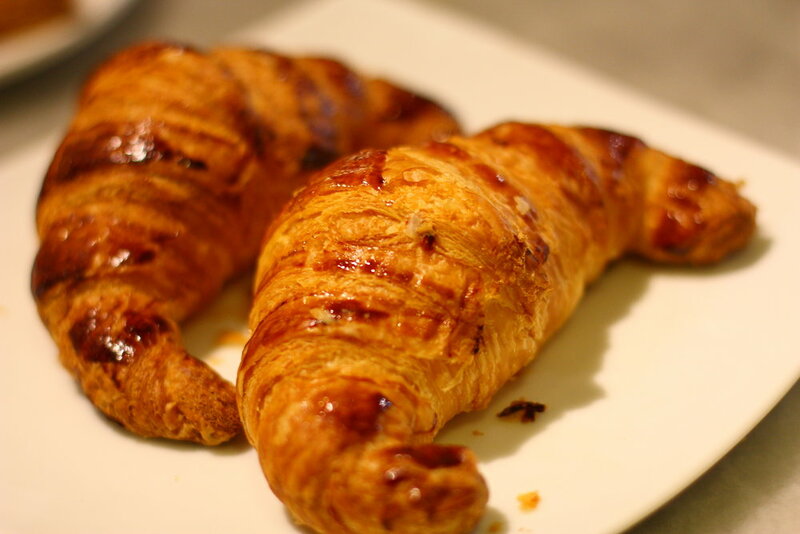 Breakfasts typically consist of a cup of tea or a bowl of either cafe-au-lait or hot chocolate accompanied by fresh bread and viennoiseries including croissants from a local bakery. You will also have a selection of yogurt, cheeses, meats and fresh fruit as well as juice to compliment the typical fare. Lunches are exciting and full of variation! Lunch is the main meal of the day in France, so this will be your most substantial meal of the day and it will be fun and different each time... You'll have two days when you can explore and eat wherever you want. There will be one day when you shop in a local market with the group to buy local specialties and produce for an outdoor picnic. One day you will go to a lavish restaurant beloved by the locals. And, the last day, you'll go to a fancy gastronomic restaurant which was awarded one Michelin star (one of the most sought-after culinary distinctions in the world). Dinners are made from scratch by your hosts at your castle or villa in a very traditional French spirit. Before dinner, Lisa and Francis will put out some nibblies and drinks so you will have the option of relaxing with an aperitif while your meal is prepared. French dinners are typically light meals, somewhat like American lunches. Lisa and Francis will prepare an array of high-quality local items including fresh vegetables, meats, a cheese platter, breads and sometimes soup, pasta or French Tabbouleh made with couscous. You'll be able to assemble a sumptuous meal to your liking. You are always welcome to pop in the kitchen where your hosts will teach you the secrets of making a French vinaigrette, and their other recipes. Refined cuisine from a Périgord restaurant. AFTERNOON: upon arrival, you can settle into your room in a genuine historic castle or charming villa. While other guests are still arriving, you can explore on your own or relax in the castle or villa with a cup of espresso or tea. RECEPTION & DINNER: In the evening, you will get together with your hosts and the rest of the group to celebrate the beginning of the sojourn French-style with a typical apéritif at 6:00 pm. You will then enjoy a laid-back dinner prepared by your hosts. Three Off-The-beaten-Path "Most beautiful villages in France"
Recommended clothing: "dressy casual" with city walking shoes. Your first daytrip is a voyage back to the Medieval period and an immersion in the local history. Your main destination, the historic and splendid village of Collonges-la-Rouge, is entirely built of red sandstone. The excursion will also include two more remote villages that stand out for their exceptional beauty, charm and historical significance. One of France's treasured "Most Beautiful Villages", Collonges-la-Rouge is actually the place where this concept was born, making it the mother, so to speak, of all most beautiful villages in the entire country. It could very well be the finest in allof France. This village is so far from all metropolitan centers that few non-Europeans get to visit it. MORNING: You will first travel to a remote hilltop village bearing the official title "Most Beautiful Village in France" where you will visit the eagle nest Medieval castle. You will then have free time to explore the rest of this cobblestone village at your own pace. 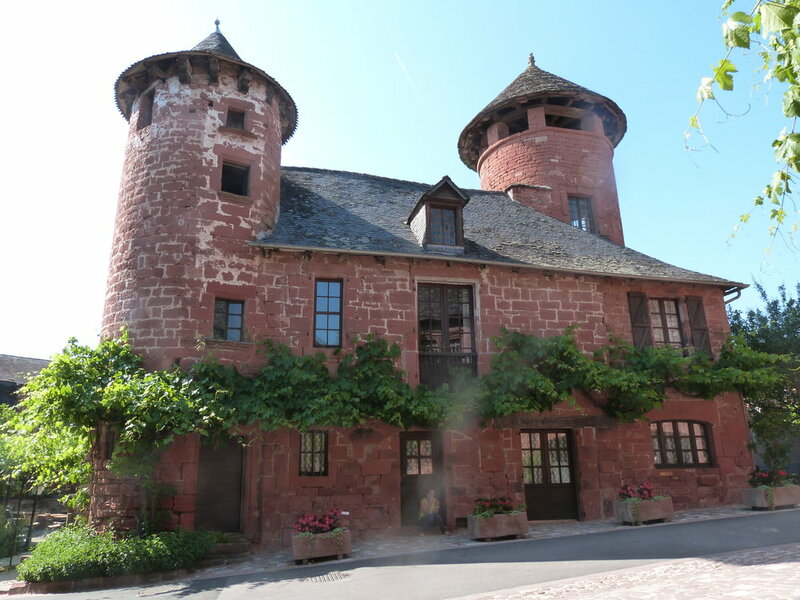 LUNCH OPTIONS: A short drive will take you to Collonges-la-Rouge, another remote "Most Beautiful Village in France" where you will first enjoy sophisticated French food in a fine restaurant. Alternatively, you may opt out of the group meal to pick your own dining option or to enjoy a more private experience. AFTERNOON: Following your meal, you will enjoy free time to visit this historical jewel. You will then meet back with the group to take another short drive to a third stunning remote village bearing the coveted but rare title of "Most Beautiful Village in France". This village owes part of its charm to its to its numerous Medieval towers and turrets. There you will have free time to explore this special place on your own. You will then return to the castle or villa where you will relax, enjoy the gardens, or have a glass of wine while your hosts prepare dinner. DINNER: You will have a typical French-style summertime dinner with an assortment of local wines at the castle or villa. Recommended clothing: “casual” with athletic shoes . The Dordogne river in the Périgord region is lined with an incredible number of ancient villages and dramatically situated castles or chateaux. Several of these villages bear the official title "Most Beautiful Village in France". Each has a distinct character, such as Domme, which is a bourgeois village perched atop a mountain with sweeping views over the lush area and the Dordogne river below. Laroque-Gageac, also one of France's "Most Beautiful Villages", is the kind of breathtaking site that all French people dream of visiting but that few ever get to see because of its remote location. 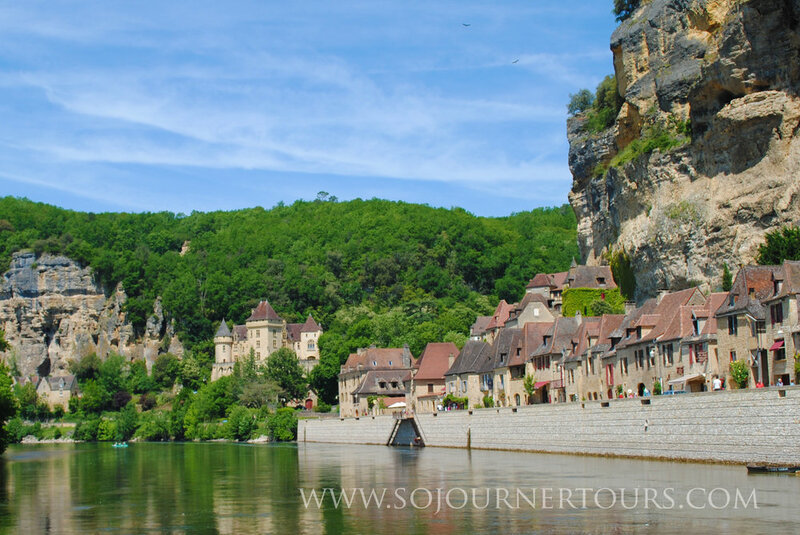 Its unique topography makes Laroque-Gageac stand out: it looks like the village has been carved out of the rock cliff that precipitously towers above it, while the Dordogne river runs along the entire length of this majestic village. MORNING: Your day will begin in one of France's "Most Beautiful Villages": Domme. It is a lovely hilltop village where you can let yourself be seduced by the panoramic views over the Dordogne river, the pedestrian streets, and the overall charm of this fortified village. You'll arrive early enough to stroll around, pop in a few places like the church, or perhaps a shop or art gallery. LUNCH: (FREE CHOICE) You'll be free to find the restaurant of your choice in Domme. Options range from simple cafes to a fine restaurant with a terrace overlooking the valley below. AFTERNOON: After lunch, you'll head to the stunning cobblestone village of Laroque-Gageac, yet another one of France's "Most Beautiful Villages". OPTION: Join your guide for an easy 2-hour canoe ride on the Dordogne river past scenic Medieval villages and castles. OPTION: Take a shorter ride in one of the traditional wooden boats that used to ferry goods back and forth on the river. OPTION: Skip the rides and enjoy spending all your time exploring the village. After everyone has had a chance to at least take a peek at the village, you'll return to the castle or villa to relax, enjoy the garden, or have a glass of wine while your hosts prepare dinner. This attractive town is renowned throughout France for its well restored Medieval & Renaissance architecture. The main attraction here is simply to get oneself lost in the maze of winding cobblestone streets to soak in the Medieval surroundings, to take in the marvelous historic heritage, and to pop into some of the numerous boutiques. 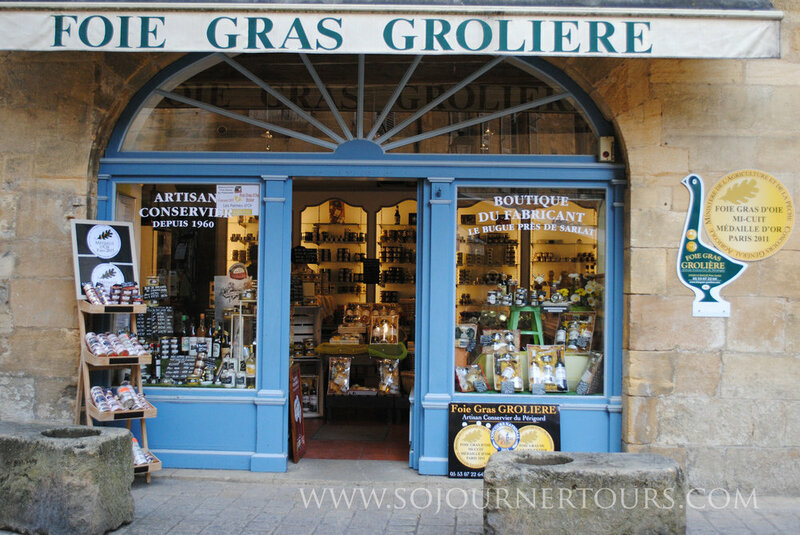 MORNING: Wednesday is the perfect day to visit Sarlat because it is Grand Market day with the town's traditional outdoor market in full swing in the morning. You will have free time to explore the market as well as the famed historic district at your own pace. This is a great opportunity to buy local crafts and souvenirs. LUNCH: (FREE CHOICE) You'll be free to select your own restaurant for lunch. There is no end to the excellent options in Sarlat. AFTERNOON: After lunch, you will head to a nearby village where an old-fashioned black truffle farm is located. There you will learn about this rare French delicacy and enjoy a tasting. Then you will head to a vineyard in the same village where you learn about and sample the local wines. After that, you'll return to the castle or villa to relax, enjoy the garden, or have a glass of wine while your hosts prepare dinner. Recommended clothing: “dressy casual” with city walking shoes. Castelnaud is one of the most famous Medieval fortresses in France. It occupies a panoramic hilltop with commandeering views over the surrounding valleys and the Dordogne river. The picturesquely restored castle houses a museum of Middle Age warfare and features reconstructions of siege machines. 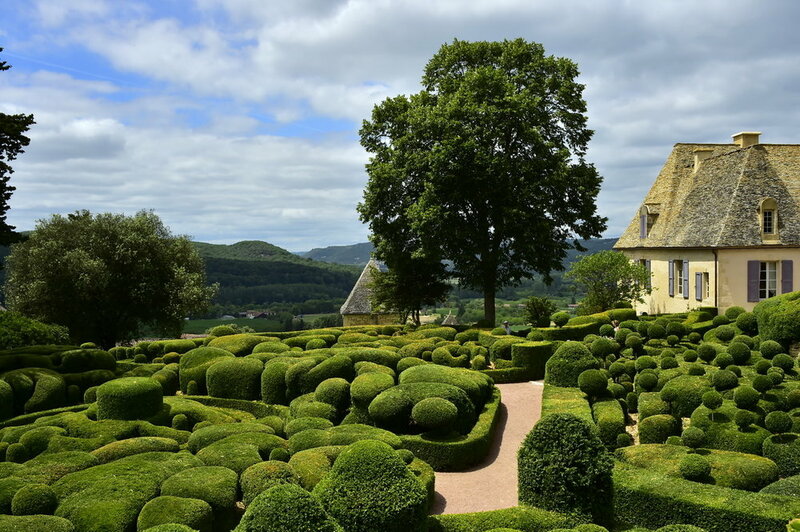 One of the most beautiful and impressive parks in France, the suspended gardens of Marqueyssac are famous for their 150,000 boxwood trees carved in fantastic shapes. The park, designed for walking, is situated on a spur which overlooks the entire Dordogne Valley and reveals a spectacular panoramic view. It also features a castle, many other species of trees and bushes, a stream and a cascade. MORNING: You will head to the fortress of Castelnaud to tour its fortifications, its museum, and Medieval war machines and to enjoy its sweeping views. 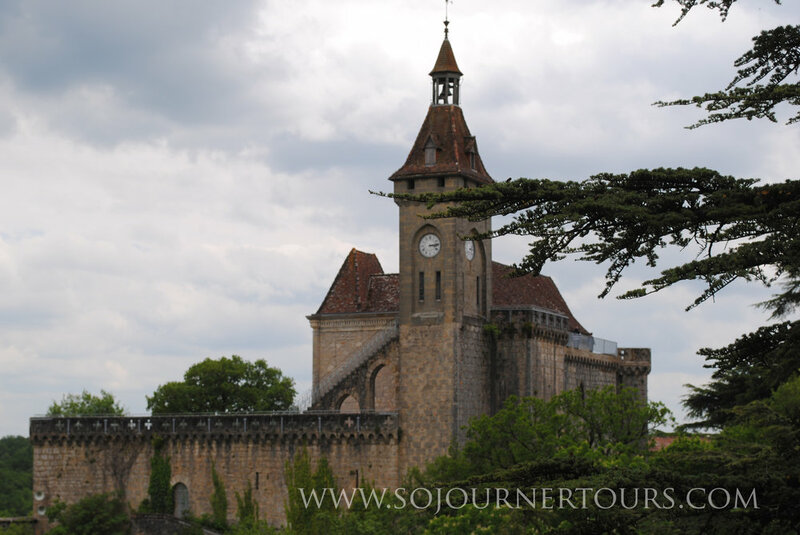 A short drive will then take you to the Gardens of Marqueyssac. LUNCH: You'll have lunch at the Gardens of Marqueyssac's bucolic restaurant. AFTERNOON: After lunch, you'll be free to wander though the vast gardens at your own pace and enjoy the panoramic viewpoints that dot the park. There are three main paths to follow. You will then return to the castle or villa to relax, enjoy the garden or have a glass of wine while your hosts prepare dinner. DINNER: You will have a typical French-style summertime dinner with an assortment of local wines a the castle or villa. 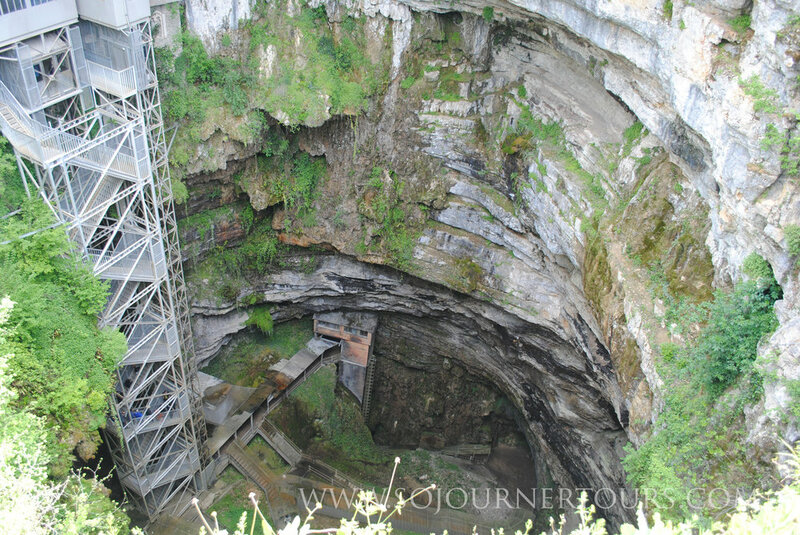 Padirac is an impressive cave system that buroughs about 10 storeys deep into the ground. At the bottom of the cave lies an underground river on which visitors enjoy a quite unique boat ride. Other features include monumental rooms and rock formations. Rocamadour's breathtaking Medieval architecture will transport you right into a Lord of the Rings movie. It is at once: a Medieval village stretched along a single marvelous cobblestone street; and a complex of astonishing centuries-old religious buildings. Its nine churches and other Christian monuments seem suspended in the air as they cling to a spectacular rock cliff in which they blend. Panoramic staircases connect all the buildings and take amazed visitors from the street below all the way to the top of the cliff. On their way up, they have multiple opportunities to take breaks to pop in churches or enjoy numerous viewpoints to take in the astonishing panoramas. MORNING: A scenic drive through the countryside will take you to the monumental Padirac cave. You will take a guided tour of this natural wonder which includes a surprising 15-minute boat ride on its underground river. LUNCH: A special treat awaits you as you will have a refined lunch in a luxurious gastronomic restaurant located a short distance from the cave in a beautiful village. This distinguished establishment housed in a lovely castle (yes, another one!) boasts a Michelin star (one of the most sought-after distinctions in the culinary world). AFTERNOON: Following lunch, you will head to the historic village of Rocamadour. In the Middle Ages, this place was a major pilgrimage center. You will first enjoy exploring the numerous shops tat line the single Medieval cobblestone street at the foot of the cliff. You will then start climbing up the stairs to explore the incredible Medieval religious complex that clings to the rock cliff. You will enjoy the stunning views and historic buildings at your own pace. On our way home, we'll stop at a traditional farm in the countrysidejust outside Rocamadour which makes the old-fashioned goat cheese that bears the name of the village. You will tour the facilities, see the goats, and get to sample this cheese, which is famous throughout France. You will then head back to the castle where you can relax, enjoy the garden, or have a glass of wine while your hosts prepare dinner. DINNER: The meal will be preceded by an aperitif featuring the most festive of French beverages: real Champagne! 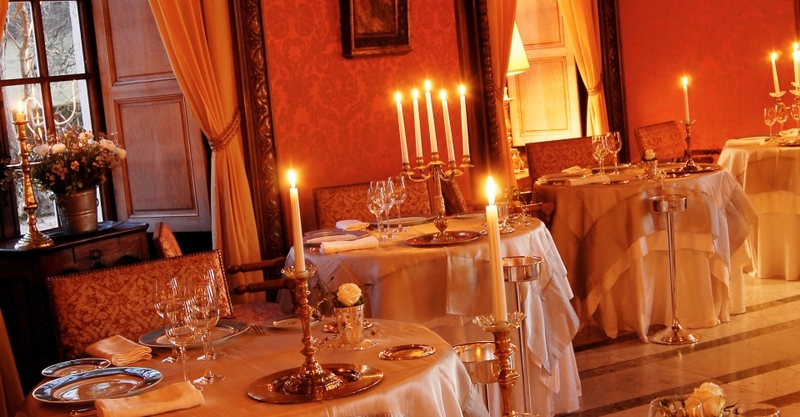 You will then have a typical French-style summertime dinner with an assortment of local wines at the castle or villa. Breakfast at the castle or villa.